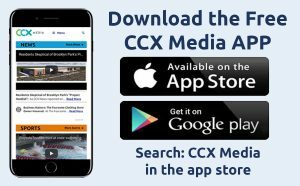 After 13 years of leading the CCX News team, news director and anchor Mike Johnson is retiring. Johnson’s career in broadcast news spans 40 years. He worked at television stations in Texas, Wisconsin and Minnesota. Mike Johnson’s TV career launched in Texas in the late 1970s with jobs at the NBC station in El Paso and later, at the NBC affiliate in Corpus Christi during the 1980s. In the 1990s, the All News Channel in St. Paul brought Mike Johnson back to his home state. Johnson went on to work a few years at the NBC station in Madison, Wisconsin during the early 2000s, but he returned to Minnesota in 2005 to work at 12 News, now known as CCX Media. Johnson started out reporting, then quickly moved into his current job as station news director and anchor. “You trust Mike when he’s delivering the news,” says Helen LaFave, communications manager for the city of Plymouth. Over the last 13 years, Johnson has built trust covering city news and government. “Mike has always been really consistently good about getting the story right and reporting the story fair,” says Jim Franzen, Robbinsdale Police Chief. “He watches our agendas for our council meetings, for planning commission meetings, he follows all of the detail,” says LaFave. Covering the news is a serious job, and Johnson has been responsible for close to 4,000 CCX newscasts. He often does double duty, operating behind the camera to interview people, and then later, reports the news in front of the camera. We have had some fun along the way too. Johnson has taken part in dozens of area parades and broadcast live for newscasts on location at annual city festivals such as Music in Plymouth and Brooklyn Park’s Tater Daze. Mike Johnson often wore a blue shirt and a red or striped tie on-air, and now he can retire that clothing. Johnson and his wife, Jackie, have six grandkids to keep their hands full. All we have left to say is thank you, Mike.